Attempting to become a bit more transitional and this was a great replacement for a rather grand brass chandler that had become rather dated. For a little bling I added magnet crystal drops. Architecturally striking, the intriguing transitional Talia chandelier references the clean lines of Arts and Crafts style. Crafted of steel with an antique gold finish, its five gracefully upturned arms are topped with cream cotton shades edged in black. Dimensions 58.6 in. H. x 26 in. W. x 26 in D.
This chandelier is exactly what I am looking for for above my dining room table. It provides a lot of light but it is not too bright. The gold finish and fabric shades are elegant. A beautiful chandelier for my dining room. Fits in beautiful with other lights. Quality is first class and installation was very easy. Price was very affordable. Definitely will purchase more items from Overstock. Pretty, sturdy, will be perfect for our step lighting. Shades are tan/brown and look great with the goldish color. The piece is not to heavy but well made. Can't wait to hang it! I love all safavieh products. I’ve never had a complaint with anything I buy of theirs. It’s affordable and quality. You can’t go wrong! This chandelier is pretty! its lightweight and cheap feeling but the colors are good, the price is right and it works in my beach house rental. "Can you dim this chandelier if you use dimmable bulbs?" It fits with our glass topped table with gold legs. Appear to go well with art work and color scheme of living room. "Can the height be adjusted in any way?" Hello Hb79, this beautiful chandelier does not feature an adjustable height. Thank you for shopping with us. 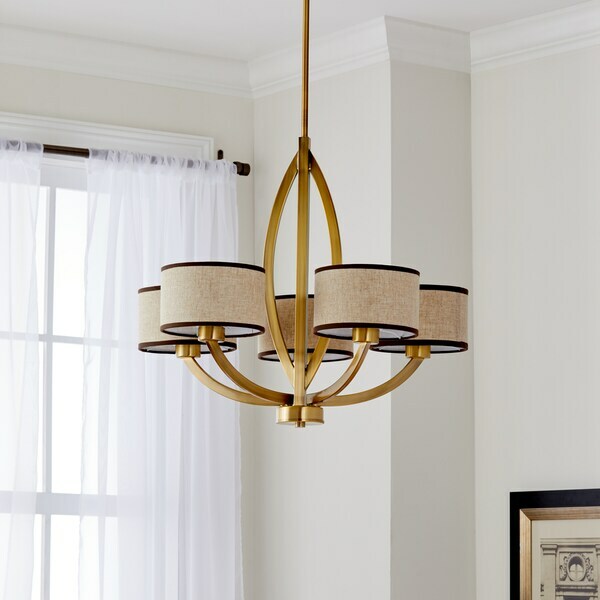 Safavieh Lighting 25-inch Adjustable 4-Light Craftsman Gold Chandelier - 25" x 25" x 19.125 - 55.125"